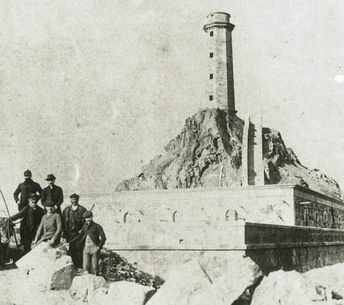 A Royal Decree from 22 October 1852 ordered the construction of a fourth order lighthouse at the top of Vilán. 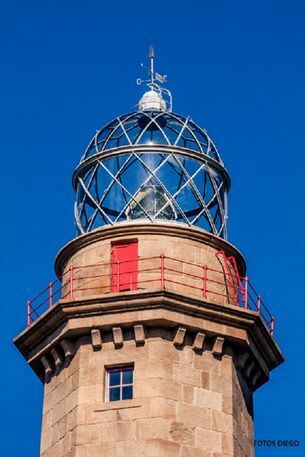 Initially, a lighthouse was built for two lighthouse keepers and two years later, the device from the Lotourneau factory included a plunger lamp that used olive oil. The focal plane rests at about 64 metres above sea level, but the lighthouse did not fulfil its function as it could not reach beyond the cape headlands, which they tried to dynamite unsuccessfully. The tower was made taller and a paraffin lamp was used. A new tower was constructed because of the failure, due to pressures from France and England, who had seen how their ships sank on this coast because of the lack of signalling. The new tower was opened on 16 January 1896, becoming the first electric lighthouse in Spain. This complex construction had two 12 HP steam machines, two magnets, a tank to feed the machines, a workshop, a coal bunker and warehouses. It was maintained by 6 people, among them lighthouse keepers, stokers and operators who lived in the old dwellings of the old lighthouse. The current tower is octagonal and is built with granite stone from the area. It is 25 metres tall and is build on a rock which rises 80 metres above sea level. This first order lighthouse has a reach of over 40 miles. It has 250 steps that join the building to the tower and access to the glass optic.